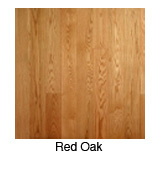 Choose your own stain and get a greater selection of plank sizes by going with unfinished hardwood flooring. The oldest form of flooring, unfinished hardwood provides a larger area for testing stains, allowing you to find the right finish, and blends in better with existing materials. Unfinished solid hardwood also comes in larger plank sizes and smaller strips. Engineered unfinished flooring, on the other hand, brings together ease of installation on every floor of a house with unlimited finish options. Unfinished solid flooring is installed over wood subfloors or is created with a floor joist system. Installation involves nailing or stapling. Most solid unfinished flooring is 3/4ths of an inch to one inch thick and 2.25 to five or seven inches wide. Smaller strip sizes are also available, and unfinished hardwood flooring can be 5/16ths to one-half of an inch thick and 1.25 inches wide. Unfinished solid hardwood is considered the highest-quality flooring product available, and installing thinner strips of this top-notch wood results in lower vertical floor height. 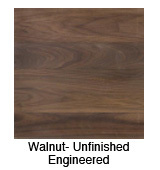 Unfinished engineered flooring, on the other hand, comes in few sizes but can be added to any floor in the house. Able to withstand moisture and heat, unfinished engineered flooring expands and contracts less than solid hardwood and can be placed over concrete or radiant in floor heat. Unfinished flooring can take up to a few weeks to install, and the space during that time needs to be clean and untouched. If you want attractive and high-quality flooring for your home, consider installing unfinished hardwood flooring and find a finish that matches perfectly. Sanding, however, is necessary for all types of unfinished flooring, and if you expect a large sanding and finishing job, choose an engineered hardwood with a thicker top layer. Engineered hardwood is composed of three to nine strips glued together, and the grain of each faces a different direction. The larger the top layer, the more times unfinished hardwood can be sanded. Grading is another asset of unfinished flooring, as the system used follows National Wood Flooring Association (NWFA) guidelines. 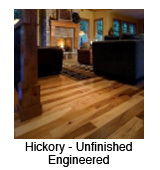 If you decide to add unfinished hickory flooring to your space, for example, your options will include: Clear grade, which has an even appearance and is composed almost entirely of heartwood; Select, which is nearly as even as Clear but has a few character marks; #1 Common starts to display more knots, streaks, and color variation; and #2 Common has even more color variation and character marks. 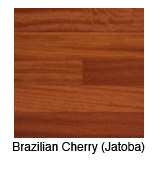 Cabin grade is also used for unfinished flooring and given to all hardwoods that do not meet the manufacturer's standards.